adults, people with disabilities, their families, and caregivers. Most immediately—as appropriators work to finalize FY18 spending levels by March 23—the Medicare Rights Center will continue to advocate for adequate funding for programs important to people with Medicare, in particular the State Health Insurance Assistance (SHIP) program. We also urge Congress to extend MFP and strongly support the inclusion of the BENES Act in this upcoming package. Please join us in making this important ask! Click here to weigh in with your lawmakers today. For more information on Medicare Rights’ advocacy around the final FY18 spending bill, please click here. For more information on the BBA of 2018, please see the Medicare Rights Center’s comprehensive analysis and one -page summary. epidemic and its side effects comes from a perhaps unlikely sponsor: Purdue Pharma, the company that makes the topselling opioid, OxyContin. After years of aggressively promoting OxyContin as a safe and effective way to combat pain, the company is — equally aggressively — recasting itself as a fundamental player in the response to a crisis that many experts say it helped to create. This week, the Medicare Rights Center submitted comments in response to the Advance Notice of Methodological Changes for Calendar Year 2019 for the Medicare Advantage CMS-HCC Risk Adjustment Model and Call Letter (Call Letter). The Call Letter outlines CMS’s payment and policy strategies for upcoming plan years. 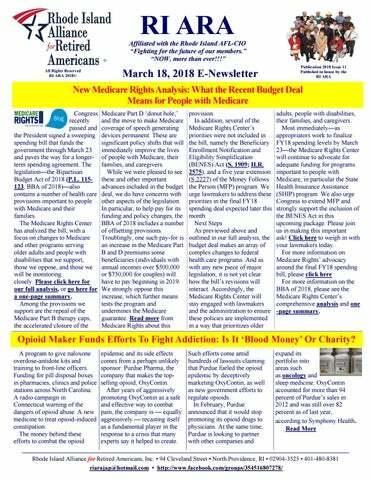 As in years past, Medicare Rights provided comprehensive comments and feedback, highlighting the concerns and issues beneficiaries tell us about on the helpline every day. 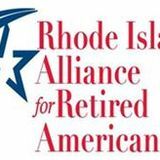 Medicare Rights believes eliminating such experiences from the Star Rating, which beneficiaries are much more likely to interact with and rely upon when choosing a plan, might mislead beneficiaries into thinking a poorly performing plan is the best choice for them. Read our comments here. documents. Two health policy experts who have been in contact with White House officials indicated that the document is consistent with ideas the administration has discussed for creating more stability and flexibility in the insurance markets. Trump was elected and appointed a Republican justice, turning the balance of the court against Democrats. Courtney is a staunch Democrat and former union leader. “This is why I and others like me have been screaming for universal health care,” he said. Janet Crow said her family will be OK, but she knows many retirees who have moved to Florida, and they have no idea what’s coming. Some of them are widows, and Crow isn’t sure if they will have enough money to live on once they start buying insurance. “If my husband died, half his pension and all his medical benefits would have went to me,” she said. “You have widows out there living on half their husband’s pensions.” Neither Courtney nor Crow know the exact details of what they will lose, but they should know soon. “It’s a mess,” Crow said. campaign and Maureen Dunn, Field Manager for the Alliance, directed the Westmoreland County Central Labor Council’s effort. She led an operation that knocked on thousands of doors and made thousands of phone calls as a cornerstone of their work. Pennsylvania Alliance President Dwayne Thomas, who lives in western Pennsylvania, and board member Harriet Ellenberger, who lives in the district, volunteered dozens of hours of their time and recruited others to join in. Digital ads Independent expenditure digital ads in support of Lamb by the Alliance ran on the three main local newspaper websites as well as on Facebook. sleep causes an increase in betaamyloid. The association, however, is so strong that a link between sleep and beta-amyloid probably exists, but exactly what that link may be isn't clear, she added. It's also unclear how much poor sleep it takes to increase beta-amyloid accumulation, the researchers said. Although beta-amyloid buildup is a sign of Alzheimer's, it doesn't doom one to the disease, and might only be a sign of other aging processes, Vemuri suggested. "Sleep has been proposed to be important for clearance of brain amyloid," she said. "This study affirms that disrupted sleep may be a risk factor for Alzheimer's disease via increased amyloid." Vemuri's team studied nearly 300 people aged 70 and older who didn't suffer from dementia. disturbed sleep may facilitate the development of Alzheimer's disease or accelerate its progression," said Bryce Mander. He's an assistant professor of psychiatry and human behavior at the University of California, Irvine School of Medicine. This is another reason you should talk to your doctor if you have sleep problems, because many are treatable, Mander said. Researchers now need to study whether treating sleep disturbances reduces plaque buildup, he added. "We know very little about how sleep treatments can impact Alzheimer's disease risk and progression," Mander said. "It is really important that we, as a society, fund and conduct the studies necessary to find out." More information visit the Alzheimer's Association. living with dementia is on board with maintaining his or her safety — and also the safety of others on the road — she or he will be more likely to accept the revocation of driving privileges. When this time comes, families should offer alternatives, such as helping with transportation for errands and doctor’s appointments, or offering public transportation as an option. Homewatch CareGivers also offers transportation assistance — help from a person outside of the family may be more easily accepted by your loved one. In the event that your loved one becomes angry or combative during this process, remember the 5 Rs. The Rs Remain calm. Don’t argue or try to reason. Take a deep breath before you act. Respond to feelings. Validate how your loved one seems to be feeling at the time. Reassure. Remind your loved one that s/ he is safe and cared for. Remove. Remove yourself physically or distance yourself psychologically for a moment to regain your composure. Return. Return fully to the situation when your loved one begins to calm down. Remember, no matter how hard you try, you can never separate the emotional connection to your loved one from the irrational behaviors, but you can try your best to respond in a manner that won’t worsen the situation. their escape plan is one of the most important steps elders can take to save their life in a fire. Plan the escape around your loved one's capabilities. Know at least two exits from every room. Make sure your loved one can unlock all doors and windows. Dementia If your relative has Alzheimer's or dementia, know that even cognitively impaired people oftentimes have an innate understanding that something is wrong during an emergency, and may be more clear-headed than you would imagine.  Remain calm during an emergency. Explain what is happening clearly and simply, but don't expect them to remember specific details. Validate their concerns, but provide clear direction without condescending or losing patience.  Provide a picture book of emergency procedures. A cognitively impaired person may be able to follow visual instructions more easily. Contact your local fire department or the National Fire Protection agency.  Practice escape routes. Cognition tends to improve and worsen at various times for people with Alzheimer's or dementia. If escape is practiced continually, instinct may take over and guide the elder to safety.  The person should sleep in a room that has easy access to the outdoors in case the home needs to be evacuated. A ground floor bedroom is best. If your parent is in the early stages of dementia and lives alone, alert the fire department ahead of time to their special needs. Regardless of their disability, all elderly people should live in a home with working smoke alarms and sprinkler systems. A working smoke alarm can reduce the risk of dying in a fire by as much as 60 percent, FEMA says. Practicing escape plans is also vital for all elders. 10 Tips for Preventing Dementia-Related Fall According to the Centers for Disease Control and Prevention (CDC), falls are the leading cause of injuryrelated deaths for older adults. Those who live with dementia are especially at risk. Impaired judgment, decline in sensory perception over time and an inability tell others about their needs can contribute to an increased fall risk for people living with Alzheimer’s disease and other dementia-related disorders. The following 10-point guide provides easy-to-follow tips that will help family members reduce falls risks for their loved ones with dementia: 1. Arrange for adequate lighting. Dementia can damage the visual system and cause illusions and misperceptions. Make sure the home has enough lighting in each room to reduce visual difficulties. People with dementia might misinterpret what they see, so reducing dark areas and shadows is vital. erase board. Using a single location simplifies the process and provides for an organized system, preventing the need for a senior to walk around looking for information. 6. Keep important things by the bed. A major issue for people living with dementia is confusion at night. Restless nights can leave them tired and unsteady. To help prevent wandering at night, keep important items on a bedside table, including water, a light source, eyeglasses, tissues and the telephone. 7. Consider unmet needs. A person living with dementia may start to wander as their condition progresses. This may lead them into unsafe areas. Wandering often signifies an unmet need a senior is trying to satisfy. For example, they may be looking for a telephone because they usually called their wife at 5 p.m. Instead of trying to physically stop the wandering, try distracting or redirecting their activity to avoid raising a person’s anxiety or frustration level. 8. Lower noise levels. As a person living with dementia may have more sensitivity to noise, you should try and decrease the level of white noise and loud sounds around them. If the noise level becomes too much, it can cause anxiety and nervousness – which can make a person with dementia unsteady on their feet. 9. Keep help at hand. For an older person who is at risk of falling, being able to quickly and easily call for help is vital. Consider various forms of remote care technology, such as a fall alert bracelet or auto detector, which can be used in case of an emergency. 10. Supply safe footwear. What a person wears on their feet can represent a major fall risk. If a shoe can easily slip off, it can cause them to trip. However, a person living with dementia may struggle with complicated articles of clothing that involve buttons or laces. Shoes with Velcro fastenings are a good solution, making footwear easy to take on and off, but also safely securing it to their feet. help to solve it." Drew reminds caregivers that “all behavior is communication." Know that sometimes there is only so much a caregiver can do and support for the caregiver and medical intervention for the person with dementia are necessary. The Alzheimer’s Association offers education programs and support groups in local areas, as well as online social media and eLearning sites atwww.alz.org, and a 24/7 Helpline at 800-272-3900.